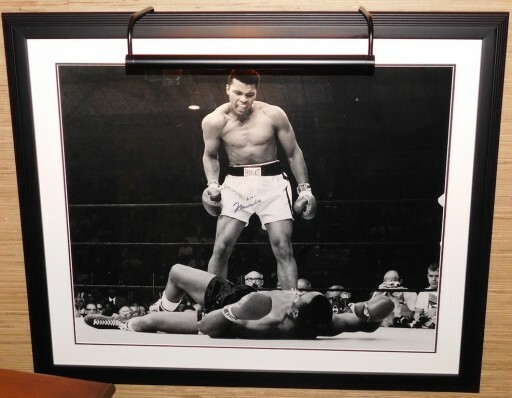 The online-only auction event is being held from November 8 to 24 and features a private collection of wine, art and authentic, rare autographed memorabilia from Robert DeNiro, James Gandolfini, Muhammad Ali, Oscar De La Hoya, and many more. Estate Auction Group, LLC., a diversified marketing firm that incorporates live and online-only auction platforms, is announcing open registration for a new special online-only auction featuring a rare collection of autographed Hollywood and sports memorabilia as well as collectible wine and art. This auction will feature reduced prices and will run through Tuesday, November 24 at 9 p.m. Central Standard Time. This Estate Auction Group’s latest find provides bidders a rare collection of fine art, memorabilia and wine. The collection includes art from such notable artists as Salvador Dali, Pablo Picasso and others. The collection also includes autographed sports memorabilia from Muhammad Ali, Oscar De La Hoya, Joe Frazier and Mike Tyson, among others. Additionally, autographed Hollywood memorabilia from actors Robert DeNiro, Sylvester Stallone and James Gandolfini are included. This collection also showcases collectible wines from Marilyn Merlot. Estate Auction Group’s online auctions are easy and convenient for bidders compared to in-person auctions. Interested bidders can browse pages of the entire auction’s collection, which is complete with detailed descriptions, photos and proposed pricing. The site requires bidders to register prior to placing a bid. Estate Auction Group offers phone and online customer support to assist prospective bidders. ABOUT ESTATE AUCTION GROUP, LLC. Estate Auction Group, LLC is a diversified marketing firm that incorporates live and online-only auction platforms for the sale of real estate, personal property and all asset class that permits transfer of ownership. For more information, visit EstateAuctionGroup.com. Registration is now open for a current online-only event being held from November 8 to 24 that features a private collection of wine, art and authentic, rare autographed memorabilia from Robert DeNiro, James Gandolfini, Muhammad Ali, Oscar De La Hoya, and many more.